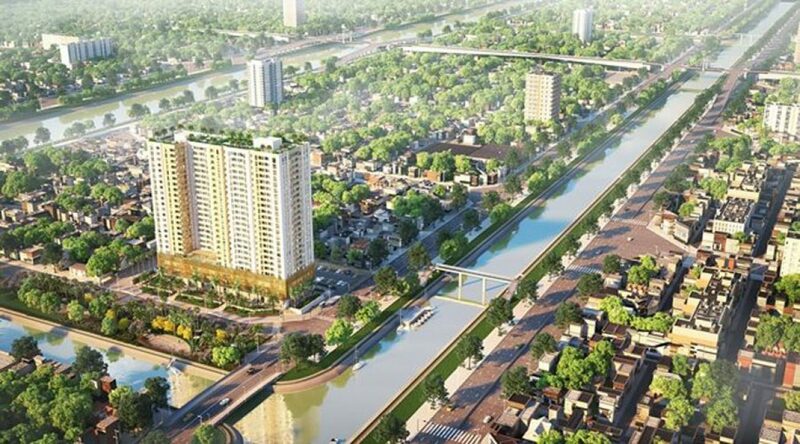 DRH Holdings in cooperation with EXIMRS has launched the Aurora Residences (District 8, HCMC). The project is located at 277 Ben Binh Dong, District 8, two river frontage and meet the standard “five forest clinic”: the nearest myopia, nhi bien, two fronts of the river, two fronts of the road, next to the big hospital and finally the center of schools from kindergarten to high school). Aurora Residences is only 5 minutes away from the busy commercial center of District 5, Big Market, just 15 minutes from Ben Thanh Market and easy access to the central area of ​​District 1, District 5, District 6 and District 10. On the area of ​​4760 sqm, DRH Holdings has developed Aurora Residences with 2 blocks of 25 storeys, including 445 units, 28 officetel units and 8 shophouses with a reasonable area of ​​45sqm. 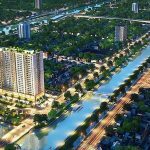 “Along with the cooperation of the leading design unit from Japan, DKO, we are quite satisfied with the design of Aurora Residences, whereby 100% of the project’s apartments are overlooking the river. DRH Holdings decided to set the best price in District 8. 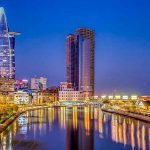 Therefore, each apartment cost only VND1.1 billion compared with other projects in the same area, the price of Aurora Residences is 25% lower, “said Le Chi Hung Viet, deputy general director of DRH Holdings. The project also has an overflowing pool at the 5th floor. The interiors of each apartment from bedroom, wood, intercome, kitchen, kitchen cabinets, kitchen to toilet use Toto brand. In addition, the sky bar is located on the 25th floor to help residents enjoy a high level of living after hours of hard labor. In addition, essential amenities such as supermarkets on the ground floor, kindergartens and especially the riverfront park help Aurora Residences establish a distinct position relative to neighboring projects. According to the investor, AuroraResidences will be officially launched in the first quarter of 2018 and will hand over the first apartments to residents after 24 months of construction. You are reading the article DRH launches Aurora Residences in Ben Binh Dong in the Real Estate category at https://realestatevietnam.com.vn/.Any information sharing, feedback please email to info@realestatevietnam.com.vn, Hotline 0909890897 (24/7).